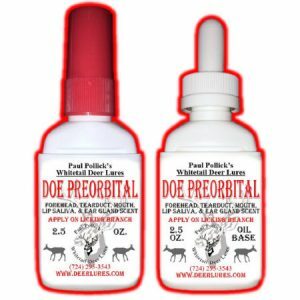 Extracted Doe Tarsal hock glands. As doe urinate over their tarsal glands, their individual sexual identity scent of their estrus cycle is carried along with the tarsal scent to the ground by her rub urination. With the approach of mating season this deer scent attracts the breeding interest of buck of all ages. 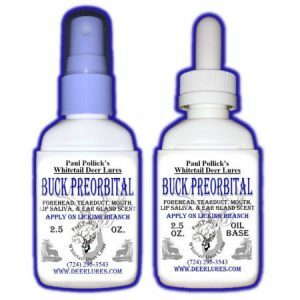 Use beginning with pre-rut, from about three weeks before peak rut, all the way through breeding season. 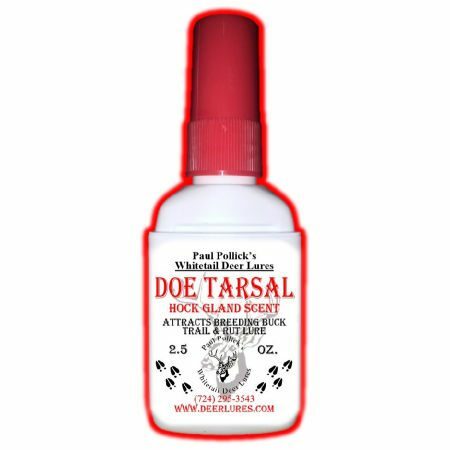 Use Doe Tarsal in natural or mock buck scrapes or lay a breeding interest scent trail. Also hang saturated scent pads or cotton balls in shooting lanes to dispense the deer scent. 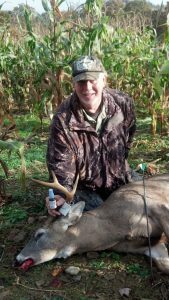 Success yesterday with your buck/doe tarsal last night. Just wanted to share the pic. Mike did just what you said to do when we were up to see you last week. He is very pleased with the results!